This is a very much delayed post...it should be up since last week, and yet I could only squeeze in some time this morning to sit down to work on it. It's so ironical that I seems to be more busy during the school holidays. Before the start of the holidays, I even put together a 'master plan' on the list of things I need to get done during these 6 weeks. There is this long list of things to-bake; a schedule of outings for the kids; and an ultimate ambitious one: a long list of spring-cleaning chores! So far I could only manage to complete the top 3 tasks on each list...and we are now left with 3 more weeks before the beginning of the new year! a chocolate birthday cake I made for my two friends. Their birthdays are only 3 days apart...and it has already became a yearly affair for the past 8 years or so that we have a get-together during this time of the year. This time we gathered at my place for dinner, and one of the birthday gals had requested for a chocolate cake. I must thank her for having such faith in me that I could come up with something decent for their birthdays. To play save, I went back to the same chocolate gateau recipe, since I had already attempted that cake twice. As usual, I frosted the cake with chocolate ganache and covered the sides with lots of chocolate chips. It was a fool-proof and very easy cover-up job. With some left over ganache, I piped...what else?! but the usual 'stars' for the border. I wonder when I would be able to pipe those beautiful 'shells' instead! 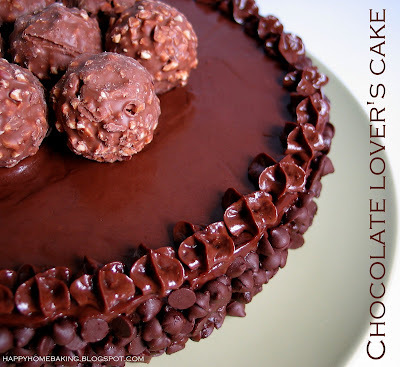 Since I know that my friends are chocolate lovers, I topped the cake with some Ferrero Rocher. I tell you, these rocher worked like magic...they turned an otherwise rather boring and plain cake into a much elegant piece. The outcome was a bittersweet, rich, dense and fudgy cake. Your cake looks sooooo pretty! Admire that you still have good friends and gatherings through the years. :) Your friends are so lucky... to have someone to bake a celebration cake! It looks so pretty & elegant! I'm sure your friends are touched by your thoughtful gesture! Was just wondering if you sift the almond flour. I attempted the cake today in an 8 inch cake tin (abt 23cm)I realised had quite abit of almond bits as i bite into them. Also, i baked it for 40 min and the top came out kinda charred but the skewer inserted was still not "clean". I checked it at 25min, 30 min ,35 min and 40 min interval and decided to take it out at 40 as i din want the cake to turn dry. It was really nice and dense though with a slight almond crunch. That's why not really smooth. Aiyo...so lucious and chocolately! How I wish I could have a slice! Grace, I am the lucky one to have them as guinea pigs! Hi youfei, I use a 8" or 20cm pan. A 23cm pan should be a 9" pan, no?? Maybe that's the reason why your cake was slightly 'shorter' and required a longer time to bake? The cake will rise in the oven and form a nice dome, however, upon cooling, the centre will sink a little. This is normal. For easy frosting, I always turn the cake around, it is easier to work with the flat bottom (which becomes the top). As for the ground almond, I didn't sieve it, I suspect yours was not fine enough? I could hardly detect the bits unless I make it a point to taste it, you know what I mean? Hi ovenhaven, thank you for your kind words! Oh goodness! Makes the other chocolate cakes looks totally dull! Such a densed & moised cake! The cake looks sooo delicious!! If I can bake this for my hubby, I think he will be so touched! I might have baked it too long for the top to be burnt. Btw, which brand of almond flour do you use? O! M! G! It looks irresistible! No words to describe your cake. Your cakes and breads are always look so nice and yummy, can I link you up to my blog? That cake looks and sounds wonderful! Hi msmelty, you can get them at cold storage, carrefour or and some ntuc outlets do carry them. Look for brands with the word "Thickened Cream" on it, you can try Bulla. For this cake, I used nestle's single cream to make the chocolate ganache instead...it comes in a small tin/canned form, which you can get at most supermarts and they are usually at the baking section. It contains much less fat. However, for recipes that requires you to whip the cream, or it is stated to use dairy cream, then you should not use this nestle cream. Hope this helps. Your cake turned out fabulous! Happy Birthday to your friends. I understand completely about having a long list of things to accomplish and getting next to nothing done. Though for me its more poor time management than anything else. I seem to like to torture myself by waiting to the last minute! Good luck to you! Your cakes look so so yummy. I've not bake before but would love to try. Can you let me know what is a good & easy cake to try for beginners like myself. I've a Rowenta table top oven. Hi Mae, I guess I'm not in any position to make any recommendation...as different people has got different preferences. When I started baking, I tried easy bakes like muffins, quickbreads and brownies. I also tried with ready-mix like Betty Crocker's muffins and brownies. They are very easy to use and follow. 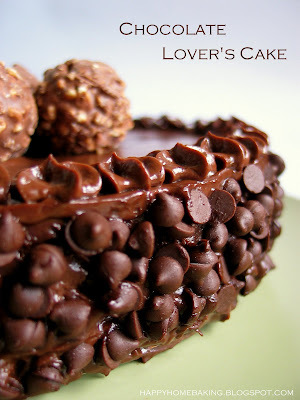 this choco cake is just lovely! i can to keep this recipe and start practicing now till my son's birthday next year for him! is it tough to make it? Beautiful. This cake looks like cakes sold in hotel.....very elegant! i could devour this cake! i tried baking your Choc Chips Brownie Muffin recipe recently but it didn't well risen.. wonder what went wrong? Im going to try again, cn you give me a tip or two, pls! Thank You! Hehe. Hi Nora, since that was suppose to be a brownies recipe, the muffins would not rise too much. It could be due to your oven temperature...did you preheat your oven? and make sure it is set at the right temperature? WOW - that is one gorgeous cake!!! This chocolate cake looks so beautiful with the colors, I'm sure it'll be a big hit with the kids! Nice colors! 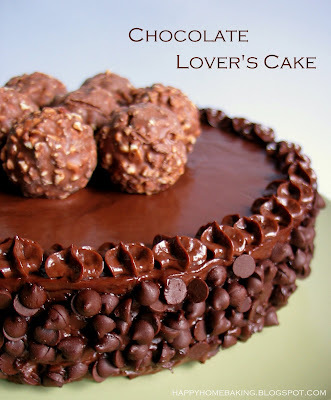 Although I'm to a big fan of chocolate cake, this sure looks yummy! I'm normally the one that will say no to chocolate cake. Hi, I have tried your ganache, do I need to put the cake in the fridge after spreading the cake? I realised after putting in the fridge everything hardens. Really love your blog. Thanks for sharing, and this cake looks very pro. Hi Angeline, I kept this cake in the fridge after spreading it with the chocolate ganache. Yes, it wil harden up as it is made mainly with chocolates. Take the cake out 15~30mins before serving/slicing and it will soften. I would like to this out. May I know where to get the piping ? It will be my first time. Kindly explain how it should be done ? Its done so professionally. Thanks for your link. It certainly helps. But recently I notice they dont sell dark chocolate Hershey, semi sweet chocolate can ? Thanks for your advise. Can I make this cake 1 day in advance and store in a fridge ? And also is it necessary to buy a springform cake pan ? You don't need a springform pan for this, a normal cake pan will do. Hi Chris, I am sorry, I don't bake for sale. Maybe you can try other bloggers who sell their bakes. Happy Bday to your gf! Hello mam, This is so awesome, I am in LOVE WITH IT, will try it on my fiance. 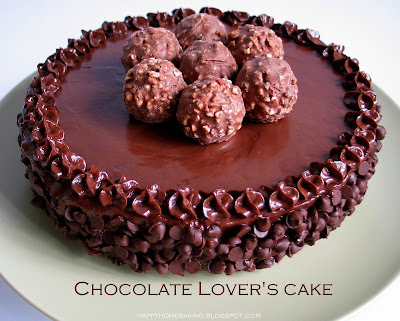 You must be like a crazy chocolate lover like me, its so tempting, where do u live, can you teach me how to make this? It'll be really great if you can help! Hi cyn, sorry I don't take order. So prof done! Hope I can do a gd job too.. May I know e reason for separating the egg white and yolk to beat in separately? Busymama, the separate eggs method is one method to make the cake batter...suppose to give a lighter texture, eg chiffon cake. Your recipes look fantastic!!! Is it possible to have an email address to contact you by? I tried sending one by the link on your page but it said I had to enter your address, which I could not find on your blog. I chanced upon the below site and found your pic there. You might want to take some action! I have already written to that site to get them to remove my photo. Thanks! Your recipes and blogs are inspiring. 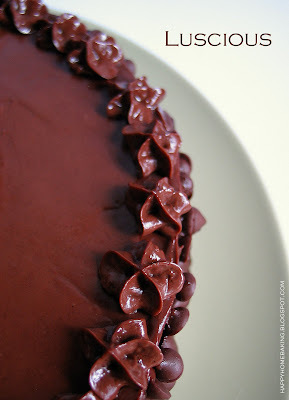 I am going to attempt this chocolate cake today. Hi, it will yield a shorter cake since square pans are bigger.